The traditional homeland of the Bedouin is the Arabian Desert in the Middle East; however, some groups have migrated into northern Africa. Today, over 200,000 Fezzan Bedouin live in Libya, and virtually all are Muslims. 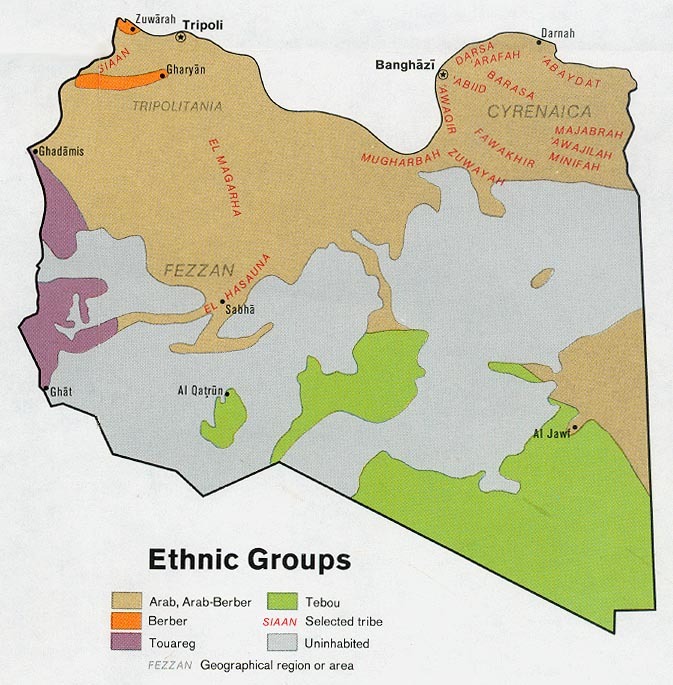 A few live in the coastal regions; however, most are located in the western part of Libya, known as Fezzan. This area lies just inside the northern edge of the Sahara Desert. The Bedouin fall into two basic social classes. One class is known as the "true" Bedouin, and they live as nomadic shepherds. The other group has embraced farming and is known as the fellahin. The fellahin lead a more settled life on the edge of the desert. In contrast, the "true" Bedouin have been known for raiding any caravans that cross their paths while journeying across barren deserts. They move into the desert during the rainy winter seasons and back to the desert's edge during the hot, dry summers. The Fezzan Bedouin speak Fazzani, or as it is more commonly called, Maghribi. The Fezzan Bedouin have a relatively harsh existence. The nomads have no permanent homes, but live in portable, black tents made from woven, goat hair. The tents are divided by a decorative partition called a gata. Half of the tent is for the women, children, cooking utensils, and storage. The other half contains a fireplace and is used for entertaining. The women do most of the work, while the men socialize and make plans for the group. The material culture of the Bedouin is limited. Their tents are their main possessions, and animals are very important for their nomadic lifestyle. Camels are their main means of transportation, while sheep and goats are bought and sold. Dairy products are the main food source for the Bedouin. Milk from camels and goats is made into yogurt and butter. Most of their meals consist of a bowl of milk, yogurt, or rice. Round loaves of unleavened bread are served when available. Dates, which can be found in desert oases, are eaten for dessert. Meat is only served on special occasions such as marriage feasts, ceremonial events, or when guests are present. To endure the extreme heat of the desert, the Bedouin wear lightweight, light-colored clothing. It is very loose-fitting, allowing for the circulation of air. Although the Bedouin once considered it degrading to have manual labor jobs, this has changed somewhat in recent years. Due to the need for better health conditions, more money, and better living conditions, some have accepted wage-paying jobs. However, most of them still despise this type of work. Almost all of the Bedouin in Libya are Malikite Muslims. Islam is based on the teachings of the prophet, Mohammed. The Koran ("holy book" of Islam) was supposedly given to Mohammed by the angel Gabriel. Islam is a religion of works that is centered on five basic "pillars." (1) A Muslim must affirm that "there is no god but Allah, and Mohammed is his prophet." (2) Five times a day he must pray while facing Mecca. (3) He must give an obligatory percentage (very similar to tithes) on an annual basis. (4) He must fast during Ramadan, the ninth month of the Muslim year. (5) He must try to make at least one pilgrimage to Mecca in his lifetime. Islam has greatly influenced the lives of the Bedouin. For example, to preserve their people, the Bedouin are only allowed to marry those inside their own group. Also, the society is patrilineal, which means that inheritances are passed down through the males. "In most interpretations of Shariah, conversion by Muslims to other religions is forbidden and is termed apostasy. Muslim theology equates apostasy to treason, and in most interpretations of shariah, the penalty for apostasy is death." * Scripture Prayers for the Bedouin, Fezzan in Libya. * Pray that God will raise up faithful intercessors who will stand in the gap for the Bedouin. * Ask God to strengthen, encourage, and protect the few known Fezzan Bedouin Christians living in Libya. * Ask the Holy Spirit to open the hearts of the Fezzan Bedouin towards Christians so that they will be receptive to the Gospel. * Ask the Lord to raise up strong local churches among the Fezzan Bedouin.